The London Female Preventive and Reformatory Institution (LFPRI) was founded in June, 1857, effectively as merger of the work previously carried out by two organisations known as the London Female Dormitory and the Female Temporary Home. The Female Dormitory, which was supervised by a 'Christian widow', provided 'family home' style accommodation for 'fallen' women, in contrast to the severe regime which existed in many 'penitentiaries' of the day. The Temporary Home performed a similar role but for women 'who had received a superior education'. It also aimed to have a preventive function in offering free or low-cost accommodation to women who were unemployed or between situations. The new scheme was instigated by Lieutenant John Blackmore who had previously been prominent in the activities of both bodies. He was assisted by Mr Edward William Thomas, who had previously been involved in Blackmore's mission work, and the 'Christian widow' who had by now become Mrs Maria Thomas. Edward Thomas became the Institution's Secretary, a position he held until his death in 1893. LFPRI's first premises were opened in 1857 at 26 Grafton Place, Euston Square, with the Thomases acting as superintendent and matron. The house had sixteen places and due to its limited space, both preventive and reformatory cases were together under the same roof. In the early, money was very short. Mrs Thomas received no salary for her work, and during the first six months Mr Thomas contributed £10 towards the rent of the home, plus £12 towards the board of his wife and himself, as well as freely giving his own services. A few months later, a gift from a benefactor who had visited the home enabled the Committee to look for larger premises. In 1858, the Institution took on the rental of 200 Euston Road, which became its Central Home and Headquarters. A lease on the property and then its freehold were subsequently acquired. In the 1880s, LFPRI's objects were formally stated as: "To seek the destitute and fallen by voluntary missionary effort; to afford temporary protection to friendless young women whose circumstances expose them to danger; to rescue fallen females, especially those decoyed from the country; to restore, when practicable, the wanderer to her family and friends, whether in town or country." Admission was by voluntary application at 200 Euston Road, where inquiries were made as to eligibility of applicants, and, if suitable, they were admitted — at once, if possible — and sent to the Home best adapted for them. Inmates were employed in housework, needlework, washing etc. up until 7 p.m., at discretion of matron. Time was also allowed for self-improvement, such as writing and reading. In the 1920s, LFPRI moved its headquarters to 3-4 Liverpool Street (now renamed Birkenhead Street), formerly part of its All Night Refuge premises. LFPRI also took over the work of another 'rescue' organisation, the Midnight Meeting Movement, founded in 1859 and in which Edward and Maria Thomas had been closely involved. Its aims were now "to train destitute friendless girls for domestic service; to shelter virtuous young women in circumstances of moral peril; to seek and reclaim the betrayed and outcast." Reconciliations were effected with relatives. 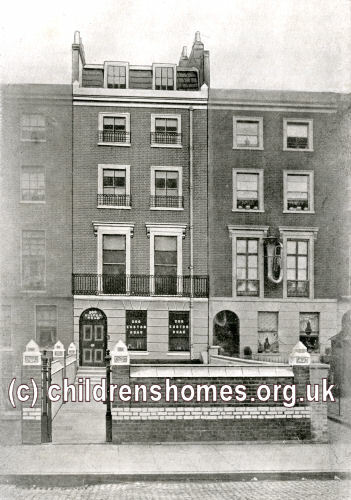 After the Second World War, LFPRI changed its name to the London Haven for Women and Girls. Due to financial problems, the organisation was wound up in 1976, with its remaining assets being passed to the Rainer Foundation which later became part of Catch22 — "a social business providing services that help people in tough situations to turn their lives around".